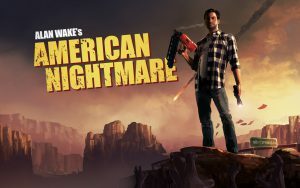 This stand alone DLC, Alan Wake’s American Nightmare serves up the same recipe and then abuses it to within an inch of its life. 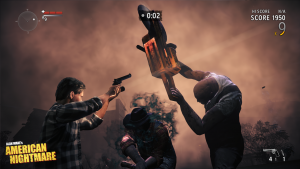 The DLC seems to be set in the dream of our funny friend Barry from the first game. I think so, but then again this is Alan Wake so anything is possible. The game started of pretty well with the same old magic giving me the creepy, tension filled gameplay. The story progresses through three main areas with simple objectives, switch this on, collect that and stay alive. Right up to the end of this third area all was going fine but then it all unravelled. You finish the end of the third zone, get a boink on the head and hey presto, you wake up again at the start of the first level. I let out a groan. The developers were aware of the irony as the Twilight Zone style narrator reinforced my groans by bloody well agreeing with them. Guess what? After you finish your second trip around all three levels you DO IT ALL AGAIN! Groan? Groan? 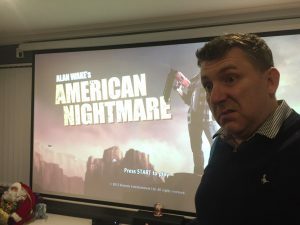 I was ready to throw the controller at Alan Wake’s ageing graphical head. Dear Jebus developers, twice was enough, twice would have been acceptable but this really was an American Nightmare. Look, the gameplay is still solid enough, torching the dark nasties until they are weak enough to shoot but this was not much more than an extended horde mode punctuated by ‘sort of’ cut scenes with awful voice acting. If I could offer a positive, the voice acting is so bad it’s good. Part of me wishes I had played four hours of original Alan Wake rather than playing this. Its kinda spoilt my memory of the orginal great game. So, I’m done. Game compete to credits. I will not be going back to the Arcade Mode offering even more horde. My advice, leave this alone and keep your rose tinted glasses firmly in place.